London's first specially-designed pensioners' playground has opened its gates to the public in Hyde Park. The £50,000 playground is fitted with six machines, including a cross-trainer and sit-up bench, each designed to exercise a different part of the body. The project was funded by Westminster City Council to provide gentle exercise for the over 60s. However, those under 60 will not be turned away. The facility is located in the park Pavilion Tennis and Bowls Centre. The so-called Hyde Park Senior Playground was funded by The Royal Parks and Westminster council's neighbourhoods budget scheme. At the request of local residents at the Knightsbridge Association, Westminster Council donated £40,000 and The Royal Parks a further £10,000 to re-landscape the area for the 125 sq m (1,345 sq ft) playground. Madeline Elsdon, from the association, said: "There are so few facilities for older people in our parks and many older people find indoor gyms expensive and intimidating with all that firm flesh on show. "We proposed a fun outside gym for those who are still young at heart and want to exercise. "It's also a chance for people to socialise and have fun. You're never too old to play." As well as a cross-trainer and sit-up bench, the facility offers a body-flexer, free runner, flex wheel and an exercise bike. Mark Camley, chief executive of The Royal Parks, said: "This is a fantastic new facility and we believe that it's going to be very popular amongst the five million people who visit Hyde Park each year. "The Royal Parks is keen to encourage people to exercise in the great outdoors, and with the Albert Memorial in the background you would be hard pushed to find a better view from any gym in London." 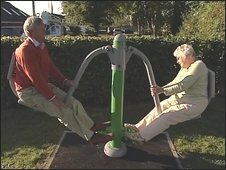 Playgrounds for the elderly were first made popular in China and later in parts of Europe.